The rooftop of La Pedrera in Barcelona. Photo by Jordi Pelegri. Skirt by Calypso St. Barth. I was really lucky to work with the super talented Jordi Pelegri, an authentic Catalan who knows the pulse of Barcelona like no other and can capture the most beautiful images. The skirt, which is another piece of art is by Calypso St. Barth. My desire to explore the architecture of Barcelona isn’t new; the city never ceases to amaze me. Barcelona reflects ancient history and evolution. What started as far back as a Roman town in times of Christ -an enclosed city with a maze of small streets surrounding a cathedral- has grown to be an extraordinary metropolis where old and new magnificently converge. It is, however, the development of Catalan Modernisme, spearheaded by Gaudi, what some consider to be Barcelona’s main draw. Modernisme is not to be confused with the Modernism of the mid-century modern architecture and design (post Second World War). The Modernisme of Gaudi is better described as a mix of Art Noveau and Neo-Gothic architecture. Gaudi’s genius ideas became a reality when he started adding vibrant colors and ornaments to facades and interiors, creating memorable structures that conveyed emotions and transforming decorative objects into functional ones. This gilded era had its peak at the beginning of the 20th century but it continues to influence architects, designers and creative people until today. Gaudi’s over-the-top buildings are everywhere in Barcelona, particularly in the area of The Eixample where some of his magnificent creations include Palau Güell, Casa Batllo and his two masterpieces: Casa Mila (also called La Pedrera) and Sagrada Familia. 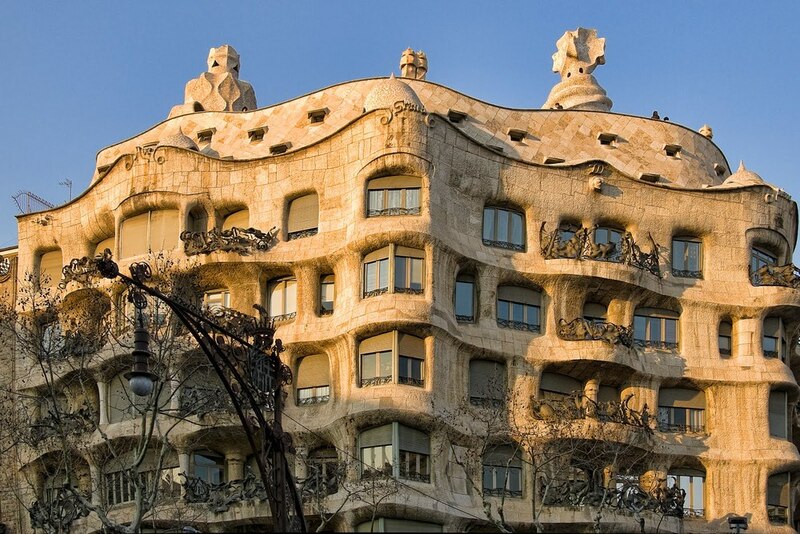 The rooftop of La Pedrera, also known as Casa Mila, is simply jaw-dropping. 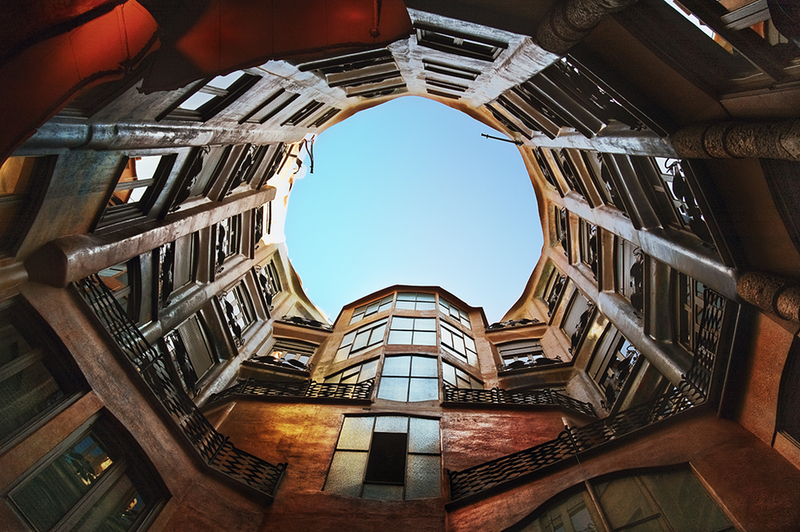 It offers a 360 degree panoramic view of Barcelona, and the ornate structures -30 of them to be more precise- host either a chimney, a stairwell or a ventilation tower: nothing was random for Gaudi. The shapes are a bit odd; they look like heads or phantoms, still they are magical and mysterious and do require close inspection. The brilliance of Gaudi expanded to the outstanding Park Güell, an outdoor fairytale like no other in the world. This is a green respite for such a busy city, filled with columns and benches covered in multicolored fragmented tiles. Terraces abound and the view of Barcelona is pretty outstanding. But it is La Sagrada Familia what is considered to be Gaudi’s masterpiece. An unfinished church that is set to be completed by 2026 (the centennial of Gaudi’s death), this building is considered a modern marvel and it is a worldwide reference for anybody who is interested in architecture. The amount of details, the carvings, the façade and the interiors that are reminiscent of an enchanted rain forest are simply stunning, even more so when we take into consideration the vastness of the structure. When in Barcelona, Gaudi's buildings are a required visit. Moreover, they are sources of inspiration even for those who like clean lines and minimalist structures. And for a man who worked passionately until the end of his life, his own words are to be remembered: “The creation continues incessantly through the media of man".